This is an adorable novel with the sweetly nostalgic feel of an old classic, which Bagram Ibatoulline intensifies with his stunning illustrations. It reminded me greatly of Margery William’s The Velveteen Rabbit. I would estimate the independent reading level suitable for tweens, but the story is a fabulous read-aloud for children as young as four and five, who would probably appreciate it more. Edward is a large, china rabbit doll beloved by a little girl. But Edward is proud and arrogant and does not return Abilene’s love. And then one day he is lost at the bottom of the sea. After many long months he passes into the hands of a fisherman and his wife only to be lost again. He changes hands many times and meets many people, and eventually Edward learns to love. Lonely hobos whisper the names of their children in his ear. A sick child nearly hugs him to death “and it felt good.” But each time, loss follows love. “I have learned to love,” Edward claims, “and it’s a terrible thing.” He wishes for wings to fly from the pain. Yet again and again his hope returns. 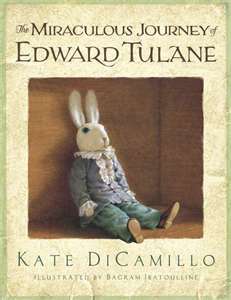 I highly recommended The Miraculous Journey of Edward Tulane. Purchase it to read before bed with your little one.